“Agreement” means this Agreement made between Nexus IP and the Customer, including all documents expressly incorporated herein. “BABT” means British Approval Board for Telecommunications. “Bring into Service Date” means the date on which the System is first brought into use by the Customer or, in the event of delays attributable to the Customer, the date from which the System can be used by the Customer if such delays had not occurred. “BSI” means British Standards Institution. “Contract Value” means that sum so named in this Agreement together with any additions thereto or deductions there from agreed in writing in accordance with this Agreement. “Customer means the party with whom Nexus IP has contracted to provide the System and services detailed herein and is defined on the front of this agreement. “Documentation” means one copy of the Manufacturers Standard user and Operator Handbook(s) together with any other documentation specifically denoted in this Agreement. “Network Operator” means a public or private telecommunications operator providing a telecommunications network or circuit regulated by statutory licence. “Ready for Service Date” means the date upon which the Systems has passed Nexus IP’s standard installation test and Nexus IP has informed the Customer that the System is available for Pre-Connection Inspection. “Nexus IP” means Nexus IP Limited. “Site” means the place defined in this Agreement to which Nexus IP will deliver the System and where required by this Agreement will undertake installation and commissioning of the System. “Software” means all operating systems and other programs of a machine readable form that are necessary for the System to operate in compliance with the performance parameters defined in this Agreement and excluding all source material including but not limited to source code listings, object code listings, flow charts and assembler instructions. “System” means all System hardware, software, documentation and services specified in the Agreement to be provided by Nexus IP to the Customer. This Agreement shall constitute the complete agreement between Nexus IP and the Customer and any other terms, conditions, performance criteria, guarantees or prior representations whatsoever shall be of no effect unless expressly incorporated herein. No variation of the conditions in this Agreement shall have effect unless expressly accepted in writing by a duly authorised officer of Nexus IP. The Customer shall not rely upon any warranty (other than stated under Condition 13 hereof) or technical statements concerning the system, which is to be supplied under this Agreement except where such statements have been confirmed in writing, and signed by a duly authorised officer of Nexus IP and expressly incorporated herein. Nexus IP reserves the right to change the specifications and parameters of the System to be supplied insofar as such changes do not materially affect the operational performance of the System. To obtain, where there is a statutory requirement for Nexus IP to do so, technical approval from the designated regulatory authority for the System to be supplied and installed in accordance with the terms of this agreement except those items which are specified by the Customer for which Nexus IP has disclaimed such responsibility in writing. To supply, install and commission the System detailed in this Agreement. To fulfil the warranty obligations defined herein. To enter, at Nexus IP’s discretion, into a maintenance agreement with the Customer upon the current Nexus IP’ terms and conditions for provision of maintenance services and at the rates then prevailing. The Customer is responsible for supplying Nexus IP when required with all necessary technical information regarding the Site at which the System is to be installed and the Customer’s operating requirements. Before delivery is due to take place the Customer shall prepare the Site in accordance with the specifications stipulated by Nexus IP and the Network Operator, and any extra costs incurred as a result of failure to do so, including storage costs, shall be paid to Nexus IP by the Customer. The Customer will provide at its own expense scaffolding, unskilled labour, lifting gear, builders’ work, electric power, heating, lighting and ventilation, and where electrical supplies are required these shall be clean and stable and will be provided and maintained by the Customer at its own expense. Any cutting away and making good of floors, ceilings, ceiling tiles and panels, trenching, back filling, the supply and erection of poles and the provision of trunking or ducting shall not be supplied by Nexus IP unless expressly agreed in writing. The Customer shall provide Nexus IP and Nexus IP’s authorised contractors with access to the Site at all reasonable times. The Customer shall obtain and pay for all necessary wayleaves and secure the approval of appropriate planning and other authorities as required. Although the manufacturer will be responsible for securing BABT/BSI approval of the design of the System, the Customer shall obtain the Network Operator’s consent for connection of an approved System to the relevant networks (if required). It is the Customer’s responsibility to arrange for such connection to be made together with the provision of any test lines, as may be required and top pay any connection and PCI charge, and to comply with any conditions relating to the connection. Installation of the System under this Agreement does not include any such connection. No liability shall attach to Nexus IP if the Network Operator denies or withdraws connection facilities to an approved System. Any other attachments to the System that are made by the Customer shall be at the Customer’s risk and the Customer shall be responsible for ensuring that they are suitable for use with the System and comply with the Network Operator’s regulations. The Customer shall not make attachments, which diminish performance or reliability of the System. The Customer is responsible for ensuring that the System will be used only in accordance with the terms and conditions of the Self-Provision Licence or the Telecommunications Services Licence, as appropriate, and as issued (from time to time) by the Secretary of State for Trade and Industry (or any special licence obtained by the Customer) and that only such private circuits are connected to the System as are permitted by such licence to be connected. Where the provision of block or extension wiring is not included under this Agreement the Customer shall be responsible for ensuring that it is or is brought up to relevant BSI standards at its own expense and shall pay the cost of any acceptance tests carried out by Nexus IP in respect of it. Changes to the technical specification and configuration of the System requested by the Customer prior to delivery will only be effective if accepted in writing by a duly authorised officer of Nexus IP and expressly incorporated into the terms of this Agreement and their implementation will be subject to full agreement in writing having been reached on any consequential adjustment to the Contract Value and target dates. Packing and delivery of the System to the Site. Block wiring to the extent specified in this Agreement. Installation where this forms part of this Agreement. o Training, to the extent specified in this Agreement. Value Added Tax or other government imposts. All items denoted as Customer’s Obligations in Condition 4 of these Conditions. Where Nexus IP is not installing the System, payment of the Contract Value shall be due and payable without deduction, set off or counterclaim in full prior to delivery of the System to the Site. In the event that the Customer is unable to take delivery of the System upon the agreed delivery date, Nexus IP reserve the right to deliver the System into Nexus IP’s stores and the Customer shall be immediately liable to pay Nexus IP the Contract Value of the System (or the portion of it so delivered) as though delivery had been made to Site. Nexus IP shall also be entitled to recover any reasonable additional costs incurred as a result of the Customer’s delay. Payments shall be made within thirty (30) days of the date of Nexus IP’s invoice and payment shall not be prevented by minor defects, which do not materially affect operational use, but Nexus IP shall remedy such minor defects within a reasonable time where it is Nexus IP’s responsibility to do so. Enter onto the Customer’s premises and recover the System delivered or installed. In such an event Nexus IP shall return any sums previously paid less sums reasonably incurred by it in the delivery, installation and recovery of the System, including depreciation in the System’s subsequent resale value. The System and installation specification shall be that which has been agreed upon in writing and expressly incorporated into this Agreement and any prior representations be they written or verbal shall be of no effect unless expressly incorporated herein. Where no such specification is detailed in this Agreement the System and installation details in Nexus IP’s quotation shall apply. The illustrations and engravings in Nexus IP’s catalogue and data sheets are intended to display the general features of the System and in the information contained in such publications shall not form part of this Agreement. All drawing, sketches and information provided by the Customer in relation to wiring and installation are contractual documents upon which Nexus IP has placed reliance. Any changes, errors or omissions to such drawings, sketches or information shall form a change to this Agreement with regards to which Nexus IP reserves the right to make additional charges, amend timescales or offer an alternative system, whichever is appropriate and suitable. Risk in the System shall pass from Nexus IP to the Customer upon delivery to the Site (or, in the event of instalment delivery to the Site, risk shall pass as and when each instalment is delivered to the Site) and the Customer shall indemnify Nexus IP against all risks in respect of the same and accept full responsibility to provide insurance cover at full replacement value. For the purpose of this Condition the term System includes any item leased by Nexus IP for demonstration purposes. Title to System hardware shall pass to the Customer only when Nexus IP has received full payment for the System hardware. However, title to System Software and the media on which it is embodied and copyright and other intellectual and industrial property right in System Software and in all data and information embodied in System hardware shall at all times remain with Nexus IP and its licensors. The Contract Value includes packaging and delivery to the Site nominated by the Customer in this Agreement by any means at Nexus IP’s disposal. Unless otherwise agreed in writing the System price comprised in the Contract Value is based upon the normal delivery timescale for the System. Where an extended delivery timescale is required by the Customer Nexus IP reserved the right to deliver to storage and claim payment accordingly. Where Nexus IP site personnel sign to acknowledge receipt of deliveries they do so as the Customer’s agent unless an agent is otherwise notified to Nexus IP by the Customer in writing prior to delivery. In this instance such personnel as are nominated by the Customer must be available to receive the System. Nexus IP shall repair or at Nexus IP’s option replace free of charge any part of the System which is lost or damaged in transit, provided that Nexus IP is given written notification of such loss or damage within such times as will enable Nexus IP to comply with the carrier’s Conditions of Carriage or, where delivery is made by Nexus IP’s own transport, within five (5) working days after counter signature by the Customer or the Customer’s agent of the Delivery Note. Where installation is included the Contract Value is based on the work being carried out during Nexus IP’s normal working hours and proceeding without hindrance to completion and may be increased if the Customer requests the work to be carried out at any other time or if the work is interrupted for reasons outside Nexus IP’s control. All ordinary cutting away is included but not making good or redecorating or work normally carried out by a specialist tradesman. Nexus IP or its contractors will install and commission the System and, within seven (7) days of Nexus IP giving notice of completion of installation, Nexus IP will carry out its standard installation tests to show that the System is Ready For Service. The System shall be Ready For Service on completing such installation tests and on completion of the same the installation will be complete and the System accepted by the Customer. The Customer will then sign Nexus IP’s Completion Certificate. If Nexus IP is unable to proceed with the tests for reasons within the control of the Customer or the Customer’s other contractors, then the System shall be deemed accepted seven (7) days after Nexus IP’s notice of completion of installation. If any part of the System fails to pass the installation tests they will be repeated within a reasonable time and on the same conditions. The System will not be deemed to have failed the installation tests on account of minor failures that do not materially affect its operational use, but Nexus IP will be obliged to rectify such failures within a reasonable time. Nexus IP will assist the Customer in arranging the Network Operator’s Pre-Connection Inspection (PCI) and be in attendance during PCI. This does not relieve the Customer from its obligations defined in Condition 4. If the System is subject to testing by the Network Operator Nexus IP accepts no responsibility for the timely conduct of such tests, and final introduction into service will occur at a date to be agreed with the Network Operator. Following PCI, Nexus IP will assist the Customer in arranging for the Network Operator to connect the System to the network. This does not relieve the Customer from his obligations under Condition 4. Following connection to the Network the System will be brought into Service. The System Software is supplied under licence in object code form and current release state on suitable media together with a configuration manual. Source materials will not be supplied under any circumstances whatsoever. Nexus IP grants the Customer non-exclusive licences to use the System Software solely with and for the operation of the System (and for no other purpose), for so long as the Customer wishes to use System Software for that purpose. The Customer may not copy, modify or merge any part of the Systems Software, media or configuration manual, nor part with possession of the same not deal with them in any manner prejudicial to Nexus IP, without Nexus IP’s prior written consent. Any copies for which consent is given must reproduce the copyright notice of Nexus IP and its licensors. The Customer undertakes to hold the Software and any associated manuals and/or documentation in strict confidence and not to make copies or make available or otherwise disclose them to any third party without the prior written consent of Nexus IP. Nexus IP transfers any manufacturer’s warranty to the customer and the customer agrees it is the manufacturer that warrants that the System will be free from defects in materials and workmanship for a period of twelve (12) months after the Ready For Service Date, subject to the System being properly used for its designed purposes and to proper maintenance, in appropriate environment conditions. Nexus IP will use all reasonable endeavours to assist the customer should they need to pursue the manufacturer during the twelve month period to repair (or at its sole option replace) defective items of Systems hardware and to correct defects in System Software, free of charge, where the defect arises as a result of faulty materials or workmanship but the manufacturer shall have the right to charge for repair, replacement or correction of defects due to any other cause. Nexus IP will pass on to the Customer any warranty offered to Nexus IP by a third party manufacturer of equipment which is attached to the System. Nexus IP shall have no liability to the Customer for any defects that occur outside the scope of this warranty. The Customer acknowledges that the System Software cannot be tested in every possible permutation and accordingly Nexus IP does not warrant that System Software will be free of all defects or that its use will be uninterrupted. The Customer assumes responsibility for ensuring that performance data equipment, Systems features and facilities stipulated by it are sufficient and suitable for the Customer’s purpose save in so far as its stipulations or orders are in accordance with Nexus IP’s written advice. All other express or implied terms, conditions or warranties in respect of quality, fitness, use or conditions of the Systems are excluded. All target dates quoted on the face of this Agreement are subject to prompt receipt by Nexus IP in accordance with agreed timescales of all necessary information from the Customer to enable Nexus IP to put the work in hand. In respect of the target dates, time shall not be of the essence. The completion date will be subject to extension if any incidence of delay is the result of the Customer’s instructions or lack of instruction, industrial dispute or any other cause beyond Nexus IP’s reasonable control. If the Ready for Service Date of all or part of the System is delayed by more than two weeks for reasons other than industrial disputes or any other causes outside Nexus IP’s reasonable control, for each further complete week of delay there shall be deducted from the Contract Value one quarter of one per cent (0.25%) of the value of such portion or portions only of the System as cannot in consequence of the said failure be made Ready for Service. The amount so deducted shall not in any case exceed five per cent (5%) of the Contract Value. Such damages shall be in full and final satisfaction of all liability of Nexus IP to the Customer for all losses of whatsoever kind the Customer may have suffered as a result of Nexus IP’s delay. Nexus IP and its insurers are immediately notified of any claim and have full power to negotiate and settle any claims. Nexus IP’s total liability for damage to property shall be limited to £1,000,000. The Customer shall similarly indemnify Nexus IP and shall maintain or procure appropriate insurance for damage to Nexus IP’s property (to the same limit) to the extent caused by the negligence of the Customer or its personnel, agents or contractors. Permitting Nexus IP to conduct and settle all negotiations and litigation. Such indemnity shall not apply to any infringement due to the use of the System in combination with other equipment and/or software not supplied by Nexus IP, or which is due to Nexus IP’s having followed the Customer’s design or instructions, or which is due to the System being used in a manner or for a purpose not specified by or disclosed to Nexus IP prior to the date of execution of this Agreement. If a claim of infringement is made or in Nexus IP’s opinion is likely to be made in respect of the System, Nexus IP shall have the right but not the obligation to procure for the Customer the right to continue using the System or to modify it in any way that it becomes non-infringing provided that the System remains capable of performing substantially the same functions as that originally supplied and the indemnity set out in Condition 15 shall not apply to the extent that Nexus IP exercises any such right. Except in the case of death or personal injury due to the negligence of Nexus IP or its subcontractors and liability of Nexus IP arising under Part 1 of the Consumer Protection Act 1987, Nexus IP shall not be liable for loss of contracts, profits, anticipated savings, revenue, business, data, software programs, use or fraudulent used of the System, or interruption In the use or availability of data, stoppage to other work or indirect or consequential loss, howsoever arising including from negligence, breach of contract and/or statutory duty before and after any termination of the Agreement. Subject to the express exceptions set out in this Agreement Nexus IP’s liability howsoever arising including from negligence, breach of contract and/or statutory duty before and after termination of this Agreement shall in no event exceed the Contract Value. The Customer commits a breach of this or any other Agreement with Nexus IP and fails to remedy such breach within a reasonable time. The Customer commits an act of bankruptcy, or compounds with its creditors, or a petition or receiving order in bankruptcy is presented or made against it; or a resolution or petition to wind up the Customer is passed or presented (otherwise than for reconstruction or amalgamation), or a receiver or manager is appointed, or the Customer is deemed under Section 123 of the Insolvency Act 1986 to be unable to pay its debts. The Customer fails to enter into an appropriate third party leasing or financing arrangement. Where the Customer has entered or will enter into third party leasing or financing arrangements this will not affect or invalidate the Terms and Conditions of this Agreement, save that title in the System (excluding software) shall pass to the third party finance provider only when Nexus IP has received full payment of the Contract Value. Other than as described above the Terms and Conditions of this Agreement have precedence over the terms and conditions of any third party leasing or financing arrangement entered into by the Customer. Neither party shall be liable for any failure to perform its obligations under this Agreement if such failure results from circumstances beyond the affected party’s reasonable control. The Customer undertakes that, whether this Agreement continues in force or not, it will keep confidential all information communicated to it by Nexus IP and will not without the prior written consent of Nexus IP disclose the same to any third party. Nexus IP Nexus IP may assign or transfer this agreement to any other company. o Customer The Customer may only assign or transfer this Agreement with Nexus IP’s prior written agreement. If any provision of this Agreement becomes invalid, illegal or unenforceable, the other provisions of this Agreement shall not be affected thereby. This Agreement shall in all respects be construed and operated as an English contract and in conformity with English Law. The legal construction of these conditions shall not be affected by their headings. Nexus IP and the Customer hereby irrevocably agree to submit to the exclusive jurisdiction of the English Courts. This Agreement becomes effective when signed by a duly authorised Nexus IP’s signatory. These conditions shall prevail over any others proposed by the Customer or implied by trade customer or practice. Nexus IP’s failure to object to any other terms and conditions shall not be deemed as a waiver of this condition. Third parties have no rights under the contracts (Rights of third Parties) Act 1999 or any amendments to or re-enactment of it to enforce any provision of this agreement. * For FREE carrier/VoIP VPN liaison on-site, traffic must continue to be routed via a Nexus IP business partner where we have a direct support relationship and not be routed via another supplier. This facilitates a relationship with the wholesale carrier who is routing your traffic that allows us to resolve issues expediently and reduces downtimes. If your traffic is routed via another provider then the level of service will be reduced to ‘Remote Fault Identification and Reporting’. **3rd party applications will be subject to the manufacturer’s support limitations. Routine maintenance and periodic inspection shall be performed in accordance with Nexus’ current procedures and the manufacturer’s recommendations, as appropriate. All faults on the system resulting from fair wear and tear shall be corrected in accordance with the appropriate cover level. Nexus IP shall use all reasonable endeavours to respond, including by remote means and by providing advice, within the time associated with the class of Service specified in the Main Schedule. Nexus IP shall provide a solution without unreasonable delay, by assisting the Client by providing advice, implementing remedial action through remote means, or arranging for a service engineer to visit site. Faults may be corrected by repair or, at Nexus IP’s option, replacement of all or part of the System with repaired equipment, delivered to the Client without a visit by a Nexus IP’s engineer if such equipment is suitable for installation by the Client. Where replacement parts are provided by Nexus IP, the parts removed shall become the property of Nexus IP. Where the cause of equipment failure has been diagnosed as lightning damage, Nexus IP shall hold the faulty items in storage for a period of one week. Where the cause of a problem with the System is proved to be a System software fault, Nexus will install a patch fix if available from the manufacturer or implement an avoidance procedure. Nexus IP may, at any time, substitute a later release of System software which will incorporate corrections in lieu of patch fixes on earlier releases. Later releases providing unchanged features and facilities shall be provided free of charge. Any modifications or additions to the System necessary to provide compatibility with a later release of System software shall be undertaken by Nexus IP and a charge made based on the equipment supplied and the work completed. If reconfiguration of the System software is necessary to alter the operational parameters of the System a charge shall be made based on the reconfiguration, implementation and associated work. Later releases of System software may create operational differences due to changes in the features and facilities available and Nexus IP shall use all reasonable endeavours to minimise such differences and to advise the Client of known differences prior to implementation. In no event shall Nexus IP be held responsible for operational difficulties caused by the integration of later releases of System software with third party supplied equipment. Replacement System software is provided under a non-exclusive and non- transferable licence for use with the System and only for the purpose for which System software is supplied. Nexus IP shall undertake the repair of wiring connected to the Call Routing Apparatus, and the repair or replacement of equipment relating to standby power supplies including rectifiers, batteries and uninterruptible power supplies (UPS) in accordance with the manufacturer’s recommendations as appropriate, at additional charge to the Client. If so requested by the Client, Nexus IP shall provide service outside the Client’s Service hours at additional charge, either by continuing work beyond the Client’s Service hours or by commencing work outside such hours. Where the Client requires Nexus IP to respond to a report relating to a fault, which is known not to be included in the Charge at the time of reporting, Nexus IP shall provide the service by way of arranged timescales mutually acceptable to both the Client and Nexus IP. Clause 5 of the Terms & Conditions describes the exclusions from the Service. It is probable that Nexus IP is prepared to undertake the work at additional charge to the Client, based on Nexus IP’s rates applicable at the time of work, subject to the receipt of the Clients authorised purchase order. In the event of a fault occurring, which cannot be attributed with certainty to the equipment comprising the System, the Client may report the fault to Nexus IP. If the fault proves not to be with the System Nexus IP reserves the right to make an additional charge for the work undertaken in response to the report (as specified in clause 5). In order to ensure excellence in our delivery of the service, calls to Nexus IP Ltd may be recorded. Nexus IP shall provide the Service described and specified within this Agreement. Nexus IP shall exercise all reasonable skill and care in the provision of the Service and shall comply with all regulatory requirements of a maintainer of Call Routing Apparatus. Competent personnel shall provide the Service in a professional manner in accordance with best industry practice. Ensuring that the environmental conditions at the site of the System comply with the requirements from time to time of Nexus IP, the Network Operator and any other approved authority. Ensuring that Nexus IP engineers have full, free and timely access to the System and logbook. Providing adequate working and storage space, and such other facilities as Nexus IP’s staff may reasonably require, and observing any common law or statutory requirements relating to health and safety at work. Maintaining all records required by the Telecommunications Services Licence (TSL) or Self-Provision Licence (SPL) as issued from time to time by the Department of Trade and Industry, and making such records available to Nexus IP. Indemnifying Nexus IP against any claims arising against Nexus IP due to the Client permitting the System to be altered, adjusted or interfered with by other than Nexus IP authorised engineers, or due to Nexus IP being unable to keep the System in good working order due to causes within the control of the Client. Complying with all statutory requirements concerning the use of the System. Obtaining and paying for all licences necessary for operation of the System. Preventing anyone other than Nexus IP’s staff from altering, adjusting or otherwise interfering with the System or any equipment belonging to Nexus IP without Nexus IP’s prior written consent which shall not be withheld unreasonably. Ensuring that all drawings, sketches and information supplied to Nexus IP upon which Nexus IP shall rely are sufficiently accurate and factual for Nexus IP purposes. Maintaining all consents necessary for access, delivery, installation, sitting and maintenance of Disaster Recovery equipment, if applicable, and to provide, without charge, power and other facilities reasonably required by Nexus IP. Ensuring that the network connection point is undamaged and accessible to Nexus IP and repairing any damage preventing the connection of Disaster Recovery equipment if applicable. Providing Nexus IP with a documented shelf map and System software dump and advising Nexus IP of any changes thereto, and providing full network configuration information where the Service includes RADIX Service. Save where expressly provided otherwise in this Agreement, Nexus IP’s aggregate annual liability under and or in connection with this Agreement and howsoever arising, shall be limited to the greater of £5,000 or the element of one year’s Charge applicable to the Site where and on the date that the liability arises. Nexus IP’s liability for damage to the property of the Client arising from any cause whatsoever shall not exceed £1,000,000 in respect of one incident or £2,000,000 in respect of any series of incidents arising from a common cause in a twelve-month period. Except in the case of death or personal injury due to Nexus IP’s negligence and any liability of Nexus IP arising under Part 1 of the Consumer Protection Act 1987, in no event shall Nexus IP be liable under or in connection with this Agreement, for any loss of contracts, profits, anticipated savings, revenue, business or use of the Hardware and or Software, loss of data or software programs, interruption in the use or availability of data, stoppage to other work, nor for any indirect or consequential losses arising from negligence, breach of contract and/or statutory duty. Nexus IP shall not be liable for the fraudulent use of the System by the Client and/or third parties. Nexus IP does not exclude or restrict liability for death or personal injury due to its negligence or liability arising under Part 1 of the Consumer Protection Act 1987. Each provision of this clause shall survive independently and Nexus IP entire liability under and in connection with this Agreement is set out in this clause. All other terms implied by statute, law or customs are excluded. Nexus IP shall not be liable for the failure to provide the Service if the failure results from any force majeure event (whether happening in the United Kingdom or elsewhere), such as, but not limited to, Act of God, refusal of licence or other Government act, fire, explosion, accident, lightning damage, electromagnetic interference, radio interference, industrial dispute, failure on the part of Nexus IP’s suppliers, or any cause beyond Nexus IP’s reasonable control. Clause 3 shall apply before and after termination of this Agreement. The Charge for the Service, exclusive of VAT and such other UK taxes as may be payable on the supply of equipment and services from time to time, is specified in the Main Schedule. It is payable annually in advance and the time for payment shall be of the essence for this Agreement. Nexus IP may adjust the Charge effective at any time following expiry of the first year of the Service, however, this shall not occur more frequently than once in any twelve month period. Adjustments shall not normally exceed the change in the Retail Price Index, (all items). The Charge may be adjusted in the event that the cover level provided for the System is changed by agreement, or any changes are made to the requirements of the Network Operator affecting the provision of the Service, or revised software is installed in the System, or the software installed in the System is no longer a current release, or the System is extended by the addition of further hardware or software. In any such event, the Charge may be amended immediately in accordance with Nexus IP’s then current charges. Any additional charge, for example, as a result of work described in clause 5, shall be payable in accordance the terms specified in the relevant Nexus IP invoice. Should any sum due for payment be in arrears for fifteen days or more, Nexus IP shall be under no obligation to provide the Service, and any additional charges incurred as a result of the delay in carrying out the Service shall be paid by the Client. Any payment due to Nexus IP under this Agreement which is fifteen days or more overdue shall bear interest on a day to day basis at the rate of 4% over the Base Lending Rate of the National Westminster Bank, from due date until the date payment is received, until and following any court judgment. Monies received may be applied by Nexus IP against such interest prior to application against other monies due from the Client. Work covered by this Agreement taking longer or attracting additional costs as a result of any of the causes in sub-clauses 5.1.1 to 5.1.15 inclusive. This Agreement shall continue for the minimum term specified in the Main Schedule, even if the equipment is in anyway lost, stolen, damaged, not required or destroyed, which events will not frustrate this agreement, and shall renew automatically on an annual basis thereafter. Either party may terminate this Agreement on expiry of the minimum term or on expiry of any subsequent full year of service, subject to at least 42 days written notice to the other party. Any termination notice required to be given hereunder shall be sent by first-class recorded delivery post addressed to Nexus IP Limited. If either party commits any material breach of this Agreement and fails to remedy it within 30 days of receiving written notice from the other party or shall convene a meeting of its creditors or if a proposal shall be made for a voluntary arrangement within Part 1 of the Insolvency Act 1986 or a proposal for any other composition scheme or arrangement with (or assignment for the benefit of) its creditors or shall be unable to pay its debts within the meaning of Section 123 of the Insolvency Act 1986 or if a trustee receiver administrator or similar officer is appointed in respect of all or part of the business or assets or if a petition is presented or a meeting convened for the purpose of considering a resolution or other steps are taken for the winding up of the party or for the making of an administration order (otherwise than for the purpose of amalgamation or reconstruction) it shall constitute a repudiation by that party of its obligations under this Agreement, and at any time thereafter the other party may by written notice suspend performance of or terminate this Agreement. If after seven years from the date on which the System was originally brought into service Nexus IP reasonably forms the opinion that the Service can no longer be provided economically, Nexus IP shall notify the Client of the options, which it considers are available. Should Nexus IP and the Client fail to agree on a course of action, Nexus IP shall be entitled to terminate the Agreement on 42 days written notice. The Client shall indemnify Nexus IP against all claims, losses, costs, expenses, damages, fees including legal costs, it may incur due to claims against it in connection with the Transfer of Undertaking (Protection of Employment) Regulations 1981, or any statutory or regulatory modification or replacement thereof, and this Agreement. This Agreement shall be governed by English Law and be subject to the jurisdiction of the English Courts. If any provision of this Agreement is unenforceable, the other provisions of this Agreement shall remain in force. This Agreement, together with any authorised variations attached hereto, comprises the entire Agreement between the parties. No amendments to this Agreement shall be effective or binding unless they are in writing and signed by a duly authorised representative of Nexus IP. Rights accrued at the date of any termination of this Agreement and rights intended by their nature to survive termination shall survive any such termination. Failure by either party to enforce or exercise any right under this Agreement shall not amount to a waiver or bar to enforcement of that right. Clause headings shall not affect legal interpretation of this Agreement. The Client shall not assign or otherwise deal with its rights or obligations under this Agreement without the prior written consent of Nexus IP. Nexus IP shall have the right to assign, novate or delegate or otherwise deal with all or any of its rights and obligations upon notification to the Client. Neither party shall disclose any information relating to this Agreement without the express consent of the other party whether this Agreement continues in force or not. For the duration of this Agreement and for one year following its termination the Client shall not employ Nexus IP’s staff that have provided services to the Client under this Agreement. These Terms & Conditions shall prevail over any proposed by the Client or implied by trade custom or practice. 1 – Welcome to Circuit! 1.2 Please read this document carefully. It is part of the legal relationship between your business or organisation and Nexus IP regarding the use of Circuit and the associated software and services. Prior to using Circuit, your business or organisation must accept the TOS and agree that any person to whom your business or organisation grants access to its Circuit Tenancy, are bound by these TOS and the documents referenced herein. 1.3 You and your business, or your organisation, are collectively addressed as “you”. This and other capitalised terms used in the Agreement are defined in the section Definitions in this document. 2.1 Circuit will be provided to you by Nexus IP from the Effective Date. Nexus IP will obtain the Circuit service –possibly via distributors – ultimately from Unify. The scope of Circuit’s functionalities is described in the document Product and Service Description which is posted on the Circuit portal on Nexus IPs website. The Service Level Agreement (SLA) included in this document describes the service levels that apply to Circuit. 2.2 You acknowledge that Circuit is not a replacement for your primary telephone or internet service. You do not rely on Circuit as your sole means of telecommunication. The services of a telecommunications provider for the public are not part of the Agreement.You also acknowledge that Circuit is not intended to support or carry emergency calls such as calls to hospitals, police, fire departments or other kind of services that connect a user to emergency services answering point. It is your responsibility to provide for fixed (landline) telephone services or wireless(mobile) telephone services that offer access to such emergency services. Circuit does not support the special features required by emergency services, such a providing information about the location of the caller to the emergency service. Please note that this also applies if, technically, you could actually connect from Circuit to an emergency service. In this case, you will need to provide details of your physical location to enable the emergency services to respond to you. (b) laws or regulations relating to the recording of communications, including, when required, advising all participants in a recorded Circuit audio or video conversation or meeting that it is being recorded and that Circuit User Data and Personal Data may be transferred outside the European Economic Area and the US. It is your responsibility to ensure that you have the right to use the Services where you are located, as well as where your meeting invitees are located. When you sign up for Circuit, Unify will provide you with access to a variety of support services for Circuit, including FAQs, videos and other technical support literature, support and communication forums such as the Circuit Support Forum and other product- and service-related information. The exact scope of the support services available to you may vary by the applicable Service Package/Circuit Support Plan. 4.2 Without limitation to the statutory rules on businesses by appearance, if Nexus IP reasonably believes that you or a specific Circuit User does not meet the above-stated requirements, Nexus IP may, without liability and at its sole discretion, block or delete that Circuit User Account(s) and their Circuit User Data and/or any portion, aspect or feature of Circuit. Depending on the case, Nexus IP may elect to terminate the entire Agreement for the cause with immediate effect. 5.1 To sign up for Circuit, you must complete a registration process and provide current, complete and accurate information, as prompted by the registration form. If you act for a business or organisation, you may need, depending upon the legal jurisdiction in which your business or organisation operates, to conclude the Data Processing Agreement (DPA) with Nexus IP . 5.2 The registration for Circuit, whether or not it is for a Free or Trial version, and including those registrations made through Nexus IP, will result in a binding proposal from your business or organisation to Nexus IP to enter into a Subscription Agreement. You will be informed if your proposal is accepted via direct email or through Nexus IP. Nexus IP and Unify are free to accept or deny any such proposal at their sole discretion. If it is accepted, the Agreement becomes effective, and if it is rejected, there is no Agreement and neither you nor Nexus IP nor Unify have any liability against any other party. 5.3 Once your proposal has been accepted, you and any other Circuit User you create through the Circuit administration console will be given a username and password via email, which, upon initial access, must be changed to a password known only to such Circuit User. You must ensure that your password(s) do not become known to unauthorised third parties. In the event you reasonably suspect that your password(s) have been compromised, you must notify Nexus IP without delay. You are liable for all damages due to your fault to maintain the confidentiality of the passwords. 5.4 The first Circuit User that is created for your business or organisation during the signup process will hold the role of the Circuit Tenancy Administrator. That first Circuit User will also hold the role of Customer Contact. The password for that account should be handled with special care. Unify and Nexus IP are very interested to hear your comments, criticisms and suggestions for changes with respect to the design, the functionality and the performance of Circuit.To the extent you provide Unify or Nexus IP with such information and data about the tests you have done, the test results, and other material such as screenshots, recordings, concepts, etc. (collectively,“Feedback”), you agree that Unify or Nexus IP own all Feedback that you submit to Unify. You hereby assign and grant Unify or Nexus IP all rights, title and interest in the Feedback and all Intellectual Property Rights herein, including the right to use, share, and commercialise the Feedback in any way and for any purpose. If requested by Unify, you or the competent person(s) within your organisation will execute such further instruments as Unify may reasonably request confirming Unify’s unlimited ownership interest in such Feedback.You will not give any Feedback that is subject to a license that requires Unify or your Nexus IP to grant any rights (e.g. Freeware and Open Source License) or make any payments to third parties because the Feedback was incorporated into Circuit or the Documentation or any other of Unify’s products, software, or services or other items. These rights survive this Agreement.For the avoidance of doubt, with the exception of the Feedback you provide to Unify, Unify does not claim ownership of any of the User Content you submit to Circuit (see also below). You should carefully review your Feedback and possibly clean it of any User Content that you do not want Unify or Nexus IP to own. You acknowledge that the Circuit service can treat all Circuit User Data submitted by you or one of your Circuit Users to Circuit is owned by you. The Circuit service is only acting as a passive conduit for your Circuit User Data. Neither Unify nor Nexus IP claim any ownership rights in your Circuit User Data and will not review, share, distribute, or reference your Circuit User Data except as provided herein or in the Acceptable Use Policy (AUP) for Circuit, or as this may be required by Applicable Laws. The AUP is posted on the Circuit portal on Nexus IP’s website. 7.3 If you object to any third-party Circuit User Data, Nexus IP will attempt to resolve that as per the procedure described in the Acceptable Use Policy (AUP). In the event Nexus IP finds such third-party Circuit User Data to be permissible under the AUP, your sole remedy is to cease using Circuit. However, this does not constitute a right to prematurely terminate the Agreement with Nexus IP. 7.4 If you believe that Nexus IP , Unify or any of their affiliates or a third-party Circuit User (including Guest Users) violated a copyright, please first notify Nexus IP of the potential copyright infringement or other intellectual property rights issue before taking legal action. The violation-resolution procedure described in the Acceptable Use Policy (AUP) shall be applied accordingly. 8.1 You are entirely responsible for any and all activities that occur under your Circuit Accounts and with your Circuit User Data. With your subscription to Circuit you acknowledge and consent, and you will make all of your Circuit Users including Guest Users acknowledge and consent, that all Circuit User Data is your sole responsibility.Circuit User Data may be accessible by the Circuit Tenancy Administrator. If a Circuit User is deleted, the Circuit User Data of that Circuit User may still be accessed by other Circuit Users who shared a Conversation with that Circuit User.For technical reasons, inside the Circuit Support Forum accounts of Circuit Users who posted content to the Circuit Support Forum will be disabled, not deleted. See the Support Forum Rules (SFR) for details. The SFR is posted on the Circuit portal on Nexus IP’s website. 8.2 You will indemnify, defend and hold harmless Nexus IP and Unify from any and all third-party claims, liability, damages and/or costs (including, but not limited to, attorneys’ fees) arising from your violation of sections 7 to 9. 9.3 With regard to the Personal Data stored or otherwise processed by Circuit, Nexus IP will observe your directions and shall take the necessary technical and organisational measures with Unify to protect the Personal Data from disclosure or misuse. This shall also apply to Personal Data that Unify retains after the termination or expiry of this Agreement. Nexus IP ’s liability for breaches of data protection shall be excluded if Nexus IP acted in accordance with a direction given by you. 9.5 Unify may use subcontractors to Produce Circuit. To the extent Unify uses subcontractors, Unify will impose upon them a similar obligation as per this section 11, in particular, section 11.2 in accordance with the data protection provisions of this Agreement and Applicable Laws. Where required by applicable law, they shall be bound by contractual terms no less binding than the Data Processing Agreement (DPA) with Nexus IP and follow a standard that meets or exceeds the standard provided for in the Data Privacy Statement (DPS) which is posted on the Circuit portal on Nexus IP’s website. 9.6 Unify and Nexus IP do not have control over and are not responsible for, the privacy of any Circuit User Data that you have shared with others, so always use caution when giving out any Circuit User Data that may contain Personal Data or other sensitive information. You agree to meet all statutorily required preconditions for your intended use of Circuit and the Circuit User Data for which you are responsible, e.g. by obtaining consent from employees so that in this regard Circuit can be provided to you without you infringing any Applicable Laws. You are in particular responsible for observing your worker’s council rights of co-determination, where applicable. You and your organisation shall indemnify Unify from all claims and damages resulting from your failure to do so. 9.8 Where required by applicable law, if you represent an organisation that signs up several Circuit Users for Circuit (Customer), you acknowledge and accept that primarily the Data Processing Agreement (DPA) shall determine your data privacy relationship with Nexus IP. Thereunder, Nexus IP will act as the data processor and you will be the data controller. Nexus IP holds a DPA – possibly via Distributors – ultimately with Unify. The DPA, where applicable, takes precedence over the DPS. You hereby also agree that the terms of the DPA, where applicable, and the DPS shall apply to each of your organisation’s Circuit Users, and that you will take appropriate measures to ensure these terms are binding upon them. 10.2 Neither Nexus IP nor Unify guarantee that unauthorised third parties will never be able to defeat those measures or use your Personal Data and Circuit User Data for improper purposes. You acknowledge that you provide your Personal Data at your own risk and that Nexus IP’s and Unify’s liability with respect to Personal Data shall be limited as stipulated in this Agreement. 10.5 You agree to notify Nexus IP immediately of any unauthorised use of your Circuit Accounts or any other breach of security. Neither Nexus IP nor Unify will be liable for any loss that you may incur as a result of someone else using your passwords or Circuit Accounts, either with or without your knowledge. You acknowledge and agree that in such an event you could in turn be held liable for losses incurred by Unify, Nexus IP or another party due to someone else using your Circuit Accounts or passwords. Circuit may not be available in, or accessible from, all countries or for use in a particular location. You are responsible for following the Applicable Laws in your jurisdiction, state or country and must not use Circuit, if such use would result in a breach of Applicable Law. Unify reserves the right to modify or disable features and functionalities of Circuit and/or any related services, if required to comply with local Applicable Laws. In some cases, some of your Circuit Users may need to use a separate instance of Circuit. Unify has the right to block access to Circuit from certain countries or jurisdictions. Such limitation or modification or disablement does not entitle you to prematurely terminate the Agreement.Please contact Nexus IP, for the latest list of countries in which Circuit is available, and to learn about any functional variations applicable in certain countries or jurisdictions. 12.1 Subject to the terms of the Agreement, Nexus IP grants you, effective upon confirmation of acceptance of your subscription application, and then for each version of Circuit that is made available to you under the Agreement, a worldwide, revocable (pursuant to any termination of the Agreement), non-exclusive, royalty-free and non-transferable right under our Intellectual Property Rights to access and use Circuit from any technically compatible device that is controlled by your organisation, within the scope described in this Agreement and the Documentation. 12.3 You do not have any rights to disclose, sublicense, or otherwise transfer access to Circuit or any software that may be made available to you for download as part of your subscription to Circuit, or the related documentation, or other of Unify’s proprietary information. You may not sub-rent or sublease Circuit to any third party, including any of your Affiliates, unless explicitly agreed in writing with Nexus IP . You may not reverse engineer, reproduce, de-compile or disassemble Circuit, except to the extent expressly permitted by Applicable Law. You agree not to claim or assert title to or ownership of Circuit. 13.1 Each Party shall use all Confidential Information exclusively for the performance of the Agreement, keep all Confidential Information confidential with the same degree of care as it uses with respect to its own confidential information and in any case at least with the care of a prudent business person; and shall not make any Confidential Information available to third parties. Affiliates, subcontractors, as well as employees of a Party, their related companies and their subcontractors, shall not be regarded as third parties, provided that they “need-to-know” the Confidential Information in order for a Party to perform its obligations under the Agreement. Each Party shall provide that all recipients of any Confidential Information are bound by non-disclosure obligations that are equivalent to this Agreement. Each Party shall be responsible for the compliance of any recipients of Confidential Information with the obligations set forth in this Agreement. (e) the receiving Party is obliged to disclose under Applicable Laws, provided that, if not forbidden by such Applicable Laws, the other Party was informed of such requirement without delay so that such Party may seek a protective order or another appropriate remedy. If such protective order or another remedy cannot be obtained, or if such Party waives in writing the other Party’s obligation to comply with the terms of this section 13, such other Party shall only furnish that portion of the information which it is advised to by written opinion of counsel and which is legally required. Such Party will also take all reasonable actions to ensure that such Confidential Information it was compelled to disclose will be treated confidentially. The Party invoking an exception has to prove that the prerequisites for such exception are met. 13.3 All obligations regarding the Confidential Information in this Section shall survive the termination of the Agreement for any reason for a period of three (3) years. This time period shall begin with the end of the calendar year in which the Agreement was terminated. In the event Applicable Laws require that a Party must retain Confidential Information for a longer period of time, e.g. for taxation or audit purposes, it may only do so for the sole purpose of complying with such Applicable Laws and the confidentiality obligations stipulated in this Agreement shall continue to apply with respect to such Confidential information until it is destroyed in the Party’s ordinary course of business. 13.4 Each Party shall be entitled to request at all times the return or destruction of any Confidential Information as well as any copies thereof. The receiving Party undertakes to return, or confirm the destruction of, any Confidential Information within a time period of four (4) weeks from the receipt of such a request. (c) to the extent that the receiving Party needs the Confidential Information in order to prove the due performance of its contractual obligation or to enforce its rights. 14.1 In order to use some features of Circuit, or to use Circuit on some devices, you may have to download and install software, e.g. an app for a smartphone or tablet, or a plugin. Such software is licensed to you under the terms of the Agreement and, in addition, the terms of our End User Agreement (EULA) apply, which is posted on the Circuit portal on Nexus IP’s website. In some cases, the software may contain third-party software components, e.g. commercial components, Freeware or Open Source Software, which may be subject to additional Third Party EULAs or Open Source Licenses, respectively. Such separate licensing terms shall prevail over the EULA. A copy of the EULA and the separate licensing terms, if any, may be obtained from Nexus IP prior to entering the Agreement. Option (b) shall always be available, and covers the relevant Open Source Software used in the current version Circuit and all preceding versions, going back to at least three (3) years. 15.1 Circuit is provided in a professional manner, but Nexus IP does not warrant that your use of Circuit will always be uninterrupted or error free. The quality and manner of the provision of Circuit is described in more detail in the Service Level Agreement (SLA) in this document. 15.2 If there is a Defect in Circuit, Nexus IP will work with Unify to remedy such Defect at Nexus IP’s own cost and expense, provided that you notify Nexus IP of such Defect at least in text form without undue delay and in any case not later than five (5) Business Days from your knowledge of the Defect. 15.4 Nexus IP and Unify will decide, at their sole discretion, how and when the Defect will be fixed and whether a workaround will be provided or a correction release of Circuit will be affected. 15.5 With respect to Defects that are within Nexus IP’s area of responsibility, your sole remedy is to claim a Service Level Credit to the extent set forth in the Service Level Agreement (SLA), for eligible subscription plans. If the Defect is not remedied and materially impairs your use of Circuit in accordance with the Agreement on an ongoing basis, you may terminate the Agreement without regard to the minimum term requirement. In this case, prepaid Fees (if any) shall be refunded to you on a pro rata basis i.e. from the time your termination becomes effective. (x) in the case of Unify, the occurrence of any of the aforementioned events to its subcontractors or suppliers which result in their delay or failure to perform. 15.8 The provisions of this section 15 are exhaustive with respect to claims based on Defects. Circuit is otherwise provided “as is” and as available. Save as explicitly described in the agreement, Unify and Nexus IP make no warranties, either express, statutory or implied, including without limitation any implied warranties for merchantability fitness for a particular purpose or noninfringement of intellectual property rights. All other rights and remedies shall be excluded. Notwithstanding the above, Unify’s and Nexus IP’s statutory liability for intent, bodily damage, fraudulent behaviour, misrepresentation or under applicable product liability law shall not be affected hereby. This also applies to any other liability which cannot, by Applicable Law, be excluded by means of terms and conditions. (b) a written settlement reached between you and the third party with respect to the infringement of Intellectual Property Right, provided that Unify or Nexus IP gave prior written consent to the settlement, including reasonable costs incurred in connection therewith. 16.2 Nexus IP, in cooperation with Unify, may also, at their sole discretion and cost, procure from such third party the Intellectual Property Rights necessary to continue to provide Circuit to you ; or modify or replace the respective part of Circuit with substantially similar functionality in order to avoid the infringement. If Nexus IP fails to provide these remedies, either Party may terminate the Agreement without regard to any minimum term and Nexus IP will refund you any remaining prepaid Fees. (e) permitting Nexus IP to provide the remedies set forth in section 16.2. (g) in any event where Unify or Nexus IP followed a design or instruction furnished or given by you. (c) the claim arises from the use of the Customer Network. (ii) one hundred thousand Euro (EUR 100.000). Nexus IP’s aggregate liability under the Agreement shall be limited to an amount equal to fifty percent (50%) of the Agreement Value. 17.2 Nexus IP is not liable for loss of profit, indirect damages, consequential damages, including loss of business, loss of contracts, interruption of business, expenditures incurred and rendered unnecessary, loss or corruption of Circuit User Data, or, without limitation to section 16, claims raised by a third party against you.Where the Agreement is governed by federal or state law in the United States of America, the exclusion of liability set forth in the paragraph above will apply regardless of the form of action, whether in contract, tort, strict product liability, or otherwise, even if Nexus IP is advised in advance of the possibility of the damages in question and even if such damages were foreseeable, and even of your remedies fail of their essential purpose. 17.3 The liability of Nexus IP for loss or corruption of Circuit User Data shall be limited to the time and cost for restoring the data from the regular, general backups of the Circuit platform Unify makes as part of Unify’s normal operations. It is otherwise your obligation to ensure that important Circuit User Data is not stored on Circuit alone, and to provide for backups or copies of such Circuit User Data on a regular basis. You will not use Circuit as your sole means of storing such important data. 17.5 Unless specified otherwise in your applicable service package, your claim to service level credits as per the Service Level Agreement (SLA) in this document shall become time-barred six (6) weeks after the Incident occurred. Claims with respect to Defects shall become time-barred twelve (12) months from their respective accrual. All other claims that you may be entitled to shall become time-barred six (6) months from the date on which you became aware or should have become aware of the respective claim, but no later than twelve (12) months from their respective accrual. Any claims based on intent shall not be affected thereby. 18.1 If you submit your registration for the Circuit subscription, the Agreement becomes effective on the date your registration is accepted, as indicated through the confirmatory email which will be sent to you, or through the confirmation by Nexus IP. If you obtain Circuit “offline”, e.g. from one of Nexus IP’s sales representatives, the Agreement becomes effective on the date it is signed by you and Nexus IP or on the individually agreed date (each the “Effective Date”). 18.3 Nothing in this Agreement shall be construed to limit the right of you or Nexus IP to terminate for good cause in accordance with Applicable Laws. (e) If you are otherwise in material breach of your obligations under the Agreement and fail to remedy the breach without undue delay but no later than thirty (30) days after receipt of a written reminder, unless a reminder is not necessary by law. (b) Unify or Nexus IP are ordered to do so by a court or authority in any country. Upon such suspension, access to all of your Circuit Users and Circuit User Data may be deactivated or barred, without refund or compensation. 18.6 Upon receipt of the termination notice, you will be provided with a facility from which you can download your Circuit User’s Circuit User Data prior to the expiry of the Agreement unless prohibited by Applicable Laws. In general, the download facility will be made available for up to thirty (30) days from expiry of the Agreement. Upon expiry of that period, all of your Circuit User Accounts will be completely removed together with all Circuit User Data that such Circuit Users may have (still) stored in Circuit. Upon the termination becomes effective, you will erase or otherwise destroy all copies of the downloadable software, including apps or plugins that you may have obtained through your subscription to Circuit. With the exception of the download facility, you will also cease to use any part of Circuit even if it should still be available to you. 18.7 Notwithstanding any minimum term commitment, the Agreement may be terminated by Nexus IP at any time with effect to the end of a calendar month, giving at least one (1) year advance notice, if Unify declares Circuit to be end-of-life. 19.1 Unify may, at any time and at its sole discretion, further develop and expand Circuit and may replace or update or extend certain functionalities of Circuit by functionally equivalent functions. Unify or Nexus IP may select and/or modify at their sole discretion the equipment, hardware, software including utilities and tools, telecommunications equipment and terminals, IT systems and other items including the associated documentation (e.g. operating instructions, application guides and specifications) and the configuration used to provide Circuit to you, provided that this does not materially impair the provision of Circuit to you. Where feasible, Nexus IP will announce possible changes in Circuit that affect the system requirements, adequately in advance. 19.2 At any time, the terms of this Agreement and the other terms and conditions referenced by it may be changed, or functionality be added or removed or other changes be implemented that require changes on your side, such as a change of your browser, microphone settings or the exporting of data. In this case, Nexus IP will provide you with thirty (30) days notice by sending an email to the Customer Contact, and, at their discretion, also in other suitable forms. If you do nothing and continue to use Circuit after the change becomes effective, you are deemed to have accepted the changed terms. If you do not want to accept the changed terms, you may terminate your subscription to Circuit with effect as of the date the change to the terms of the Agreement becomes effective. In this case, you must send Nexus IP a notice. If a change has to be implemented because there is a requirement under Applicable Laws which cannot be reasonably and in a legally compliant manner be avoided or circumvented, Nexus IP will still inform you of the changes, but you do not have a right to terminate. The Fees and payment terms for Circuit are described in Annex Payment and Pricing Terms (PPT). You understand that Unify and Nexus IP may, at their sole discretion, use subcontractors and third-party suppliers for the performance of any obligations under the Agreement. Obligations under section 10 shall not be limited thereby. 22.1 Any obligations of Unify or Nexus IP under the Agreement are subject to the proviso that fulfillment is not restricted by any impediments arising out of the Applicable Export Control Laws. You, the Customer, represent that you are not a citizen of an embargoed country or a prohibited end user under Applicable Export Control Laws. 22.2 If you transfer Goods (for the purpose of this section, the term “Goods” refers to hardware and/or software and/or technology as well as corresponding documentation that is made available to you in any form, regardless of the mode of provision and explicitly including software that is made available in SaaS form, including Circuit) delivered by Nexus IP, or works or services (including all kinds of technical support) performed by Nexus IP, to a third party, or if you re-export such Goods, works or services, you must comply with the Applicable Export Control Laws. (c) you are at all times in compliance with the regulations of all applicable “Sanctioned Party Lists” or “Denied Persons Lists” or similar lists of the Federal Republic of Germany, the European Union and the United States of America concerning the trading with entities, persons and organisations listed therein. 22.4 If so required to enable a competent export control or customs authority or Unify or Nexus IP to conduct export control or customs checks, you will, upon Unify’s, Nexus IP’s or such authority’ request, promptly provide Unify, Nexus IP and the authority with all relevant information pertaining to the particular end-user or end-customer (e.g. the Circuit Users), the particular destination and the particular intended use of the Goods, works and services provided by Unify, as well as any export control restrictions required by Applicable Export Control Laws. 22.5 You will indemnify and hold harmless Unify and Nexus IP from and against any claim, proceeding, action, fine, loss, cost and damages arising out of or relating to any non-compliance of Customer with this section 22 and any breach of Applicable Export Control Laws, and you will compensate Unify and Nexus IP for all losses and expenses resulting thereof. 23.2 Under a subscription to the FREE service package for Circuit, Circuit will be provided to you without charge. The FREE service package is subject to certain technical and functional limitations, as described in the Product and Service Description (PSD), which is posted on the Circuit portal on Nexus IP’s website. You are under no obligation to purchase a paid-for subscription, and we are under no obligation to offer you a paid-for subscription. 23.4 Nexus IP will not charge you for the FREE or TRIAL service package, and in turn you will not charge Unify or Nexus IP for anything you do with, or submit to, Circuit, including Feedback. You will bear any and all costs for using of your FREE or TRIAL service package subscription. You bear the risk of, and the cost of, any loss of data, loss of revenue, time and effort caused by your use of a FREE service package subscription. 23.5 There is no specific time limit to the FREE service package subscription, but there is no warranty that subscriptions to the FREE service package will always be available. Unify or Nexus IP may discontinue to allow, or terminate, FREE service package subscriptions, or alter their service package at any time, giving at least four (4) weeks advance notice. You should not use a FREE Service package subscription or Trial subscription (as further described in section 23.8 below) with any data that you cannot afford to lose or with data of which you do not have a separate backup physically stored outside of Circuit, unless you intend to purchase a subscription later. Keep this in mind when entering or creating or receiving data using the FREE service package or a trial subscription. You understand and accept that you assume all risks of use, quality, and performance with respect to the trial use. Nexus IP and Unify disclaim any and all warranties with respect to Circuit and the related Documentation, whether express or implied, including specifically implied warranties of merchantability and fitness for a particular purpose. Nexus IP and Unify disclaim any liability for any problems in or caused by your trial use of Circuit, whether direct, indirect, special, or consequential, including loss of profits. 23.7 Nexus IP and Unify’s liability for the injury of life, body or health, for intent or in the case of mandatory statutory liability, e. g. under the German Product Liability Act, shall remain as per the Applicable Law. Any other claims for damages based on whatever legal reason, in particular loss of profit, data and/or information, consequential harm caused by a Defect, including infringement of duties arising in connection with the contract or tort, shall be excluded. Nothing in this section intends to limit Nexus IP and Unify’s mandatory statutory liability for intent, bodily damage, fraudulent behaviour, misrepresentation or under applicable product liability law. This also applies to any other liability which cannot, by Applicable Law, be excluded. (a) You must have a FREE subscription which will then, for the term of the trial, be upgraded to have the advanced functionalities that are usually only available in the paid-for service packages. (b) Nexus IP does not charge you for the trial, but you understand that the service levels and SLA credits stipulated in the Service Level Agreement (SLA) do not apply. (c) Once your trial period nears its end, Nexus IP may contact you if you would like to purchase a subscription. (d) In the event you elect to upgrade to a paid-for service package, all of your existing Circuit Users and their Circuit User Data will be migrated and available under the new subscription plan. (e) In the event you do not want to purchase a subscription, upon expiry of the TRIAL term, your subscription will be terminated. You will not be able to continue the subscription with the FREE service package. (f) Nexus IP or Unify may elect to cease offering new TRIALS at any time. (including images, text, page layout, or form) of Unify or Unify’s suppliers without Unify’s express written consent. You may not use any meta tags or any other “hidden text” utilising Unify’s or Unify’s supplier’s Marks without the respective Mark owner’s written consent. Unify Produces the Circuit service and supports Circuit Users with a service level outlined in this Annex and grants credits in case it cannot meet these service levels and certain conditions apply. Nexus IP is entitled to offer you this SLA including the SLA Credits as part of your Agreement with Nexus IP. Requests for SLA credits have to be placed with Nexus IP and Nexus IP will effectuate the credits. There is no contractual relationship between you and Unify. (a) “Availability” means the time during which Circuit is available for access and use, subject to the exclusions described in this Service Level Agreement (SLA), in particular section 2. (c) “Contracted Month” means a full monthly billing cycle during the term of the subscription. (d) “Downtime” means the total minutes in a Contracted Month during which the entirety of Circuit Core Service is unavailable. The unavailability of individual service features is not counted as Downtime, unless such unavailability renders the Circuit Core Service unavailable or inaccessible. (e) “Resolution” means the measures taken to resolve an Incident. A Resolution can also be a workaround. (f) “Response Time” means the time between receipt of a service request by Unify and the time the Circuit User Help Desk (UHD) first responds to that service request, subject to the applicable Service Hoursg. (g) “Verified Downtime” means Downtime claimed by the Customer and verified by Unify, as set forth in this Service Level Agreement (SLA). (a) Scheduled Maintenance – Scheduled MaintenanceThis is Downtime scheduled in advance to install bug-fixes, updates, and to conduct other maintenance work. Scheduled Maintenance will, in general, be done outside times of peak use of Circuit. Customers will be notified about Scheduled Maintenance in text form at least two (2) days in advance. (ii) Problems, Incidents and Defects caused by you or your network or equipment. (iii) Despite Unify’s or Nexus IP’s advice, you continue to use Circuit in a manner that is dangerous or wrongful, in particular if such use violates the Acceptable Use Policy (AUP) posted on the Circuit portal on Nexus IP’s website. (vi) Your failure to follow any applicable policies for acceptable use, including any uses of Circuit that violate the Acceptable Use Policy (AUP). (viii) Failure of the Internet connection between you and Unify’s Point-of-Presence for the data centres providing Circuit. 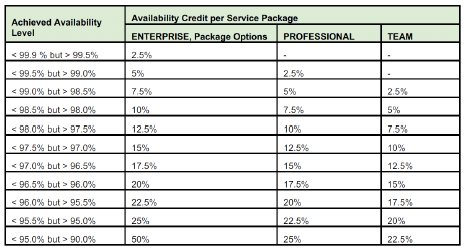 a) In the event Unify fails to meet the availability targets for Circuit for the Contracted Month, you may claim an Availability Credit with Nexus IP as per the table below. You must submit your claim to an Availability Credit through Nexus IP Customer Services no later than ten (10) Business Days after the invoice date. The service request must contain a copy of the invoice and reasonable details on the claimed downtime and the availability level not met by Unify. Nexus IP will pass the claim on to Unify. Unify is obligated to verify with reasonable judgement the claimed Downtime and respond to the claim back to Nexus IP within ten (10) Business Days if the claim could be verified by Unify (Verified Downtime) and which Availability Credit will be applied. (c) The Availability Credit will be applied by Nexus IP to the invoice following Unify’s response to your availability credit claim. The availability credit cannot exceed one hundred percent (100%) of the invoiced amount, nor can availability credits be accumulated over several Contracted Months. There is no refund of Availability Credits for the last two (2) months of the subscription where the subscription is not renewed. (e) Availability Credits will only be awarded if you have a paid-for subscription to Circuit. Availability Credits are not available if you are subscribed to a Free service package, trial subscription, or any other unpaid for test or evaluation subscription. (iii)Processing of service requests, i.e. the opening of tickets for Defects. The different support facilities are described in more detail in the Product and Service Description (PSD). Some of these support facilities are only available to you if you have subscribed to the corresponding Service Package. The extent to which you have access to these facilities and how these facilities are provided to you is subject to your Agreement with Nexus IP. 3.3 The availability of the Circuit UHD is described in the Product and Service Description (PSD). Unify will make commercially reasonable efforts to respond to requests as quickly as possible. There are no SLA credits for Circuit UHD services. (i) “Priority Level 1” means Incidents where Circuit in its entirety, as it is described in the Agreement and in particular in the Product and Service Description (PSD), is not available to all of your Circuit Users. (ii) “Priority Level 2” means Incidents where relevant parts or functionalities of Circuit, such as the search function, storage access, content sharing, etc., as they are described in the Agreement and in particular in the Product and Service Description (PSD) are not available. (iii)”Priority Level 3″ means incidents that are not assigned to priority levels 1 and 2. There is no credit if the objectives for the Response Time and the provision of a Resolution are not met. The fees for your Circuit subscription are set by Nexus IP. Unify publishes recommended selling prices (Nexus IP) on www.circuit.com. 2.1 Unify may at any time adjust the Fees (Nexus IP), provided that such adjustment reflects changes in Unify’s costs for personnel, material, hosting, third-party provided services for Circuit or other costs factors. In this case, Unify will provide you with thirty (30) days prior notice by sending an email to the Customer Contact. If a minimum term was agreed, Unify shall only increase the Fees once the first twelve (12) months of such a minimum term have expired. 2.2 If you do not want to accept the adjustment, you may extraordinarily terminate your subscription to Circuit with effect as of the date the adjustment becomes effective. In this case, you will send Unify a notice through the Customer Contact. If the change to the Fees is mandatory for Unify because of Applicable Laws, e.g. a change in taxes, Nexus IP will still inform you of the changes, but you will not have the right for extraordinary termination. 2.3 Unify may, at any time, add features and functionalities to Circuit that Unify elects to make available only for payment of additional charges. To upgrade your subscription, you may need to log in with the Circuit Tenancy Administrator account or contact Nexus IP.